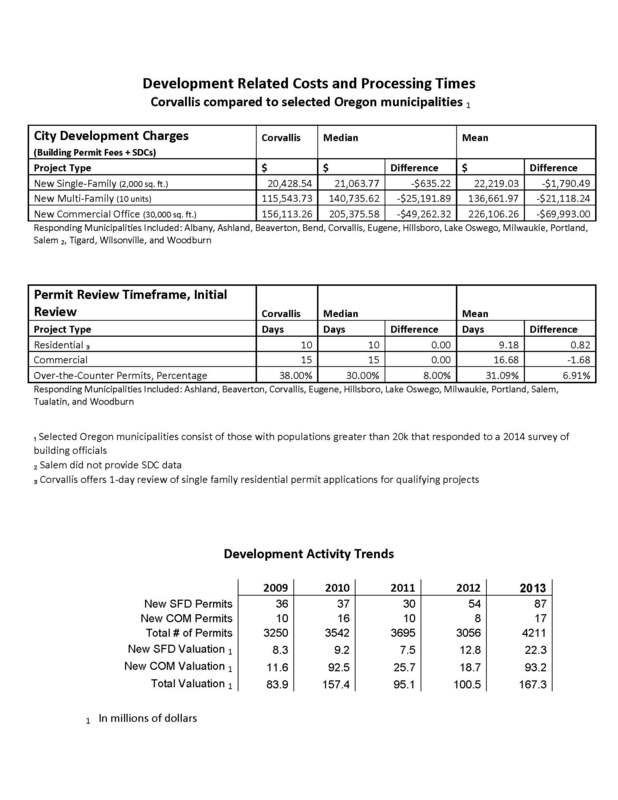 The City of Corvallis compared development related costs and fees as well as processing times for a new single family, multi-family, and commercial office against 14 other Oregon cities. The responding municipalities included: Albany, Ashland, Beaverton, Bend, Corvallis, Eugene, Hillsboro, Lake Oswego, Milwaukie, Portland, Salem, Tigard, Wilsonville, and Woodburn. Corvallis ranked substantially below the median and average for building permit fees plus system development charges in the three categories of new development. In the permit review time frame comparison, Corvallis averaged .8 days longer to initially review a residential project and 1.7 days shorter for commercial projects.